Fittonia is a great plant for a small container because it’s got fascinatingly intricate leaves, it likes the high humidity of an enclosed space (it’s often included in lists of terrarium plants), and it’s a slow grower (so it won’t outgrow the space too fast). 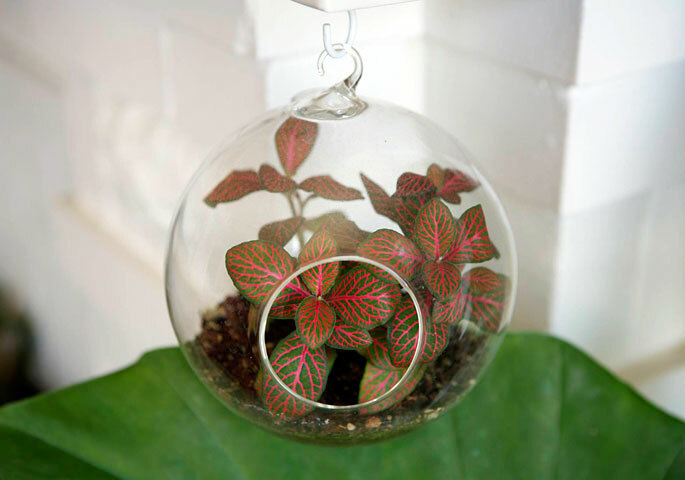 So when I was looking for something to put in this hanging glass bubble, I chose a red-veined dwarf variety. I got the glass bubble at Flora Grubb, but you can buy something similar (and cheaper) at CB2. 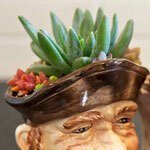 Fittonia can be found at many plant stores and garden sections of big box stores. 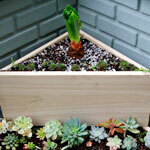 The only tricky thing about this setup is that, because the container holds very little soil, it can dry out quickly. Fittonia hate drying out, and they let you know my curling up their leaves. So just make sure it stays damp and it’ll be fine. And when the plant hits the walls, you can trim it back and plant the cuttings elsewhere. UPDATE: Mr. Subjunctive gives Fittonia the full writeup over at Plants are the Strangest People. 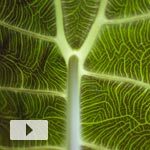 ← Can You Grow Grocery Store Taro?